Ready to ship- Wenge with Bloodwood center 26"
Super awesome dark Wenge wood with a center band of red Blood wood flanked by two thin lines of Maple. 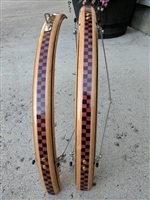 Great set of fenders to deck out your favorite bike. Made to fit 26" wheels. Width measured from side to side is 2 1/4". 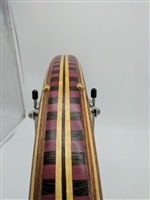 Fenders come complete as a set of front and rear with all mount hardware. Finished in satin. 1 3/4" wide designed to fit 700c wheel sizes. 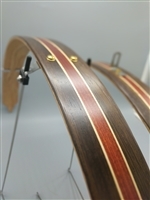 Made from chocolate brown South American Walnut with a center stripe of light tan Maple. 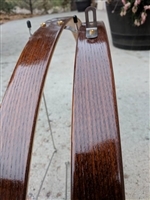 Fenders come as a complete set with mount hardware. Finished in satin. Ready to ship- Heat Treated Ash 26"
Nice rich brown Heat Treated Ash designed for 26" wheel sizes. These measure 2 1/4" from edge to edge- perfect for cruiser bikes. 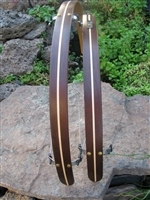 Fenders come complete as a set of front and rear with all mounting hardware. Super awesome rich brown heat treated Ash! These would go great with the brown color Brooks products. Made for 700c wheel sizes these are 1 3/4" wide measured from edge to edge. 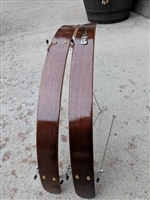 Fenders come complete as a set of front and rear fenders with all mounting hardware.